I am very sure it won’t be as good as the Pomegranate Jelly that my Aunt Josie made – my first memories of her jelly are from Christmas time nearly 60 years ago. Just saying that phrase – “60 years ago” begins to make me feel a little old! My Uncle Jim was a Foreman for Western Water Works in Taft, CA. -( I think it is called West Kern Water District now….) 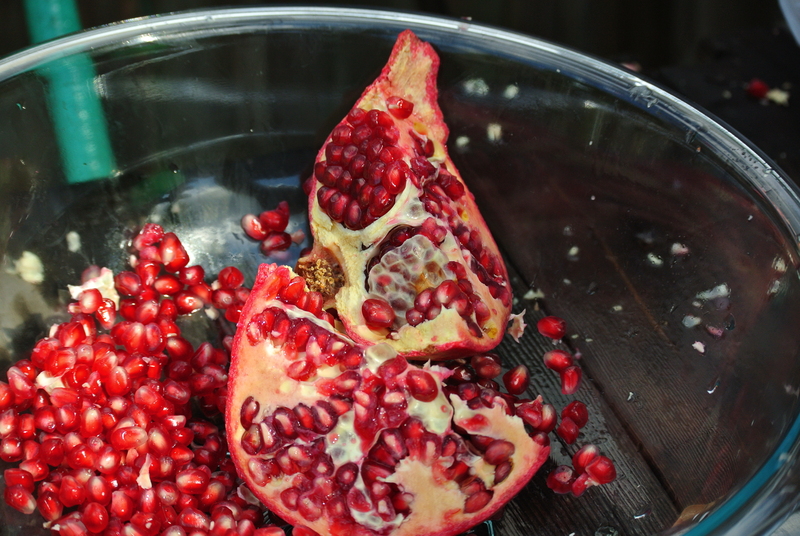 Back to the pomegranate…..the main yard in Taft was surrounded by a hedge of pomegranate bushes. They seemed to ripen in the late fall which probably coincided with my Christmas season memories of Aunt Josie’s pomegranate jelly. 60 years ago I didn’t know much more about her jelly other than how wonderful it was on my toast! My forays into making jams and jellies is relatively recent, in the past 10-25 years or so. Key differences from those long ago times, Aunt Josie sealed hers with a cap of melted paraffin. I remember seeing a row of 6 or 7 jars on a table in the dining room adjacent to the kitchen. Almost every jar has a little dollop of jelly that had oozed through the wax somehow and …… if no one was looking I wiped my finger through it and into my mouth……probably considered unsanitary by today’s standards but I don’t believe anyone ever became ill.
Now, comparing my jelly to Aunt Josie’s. 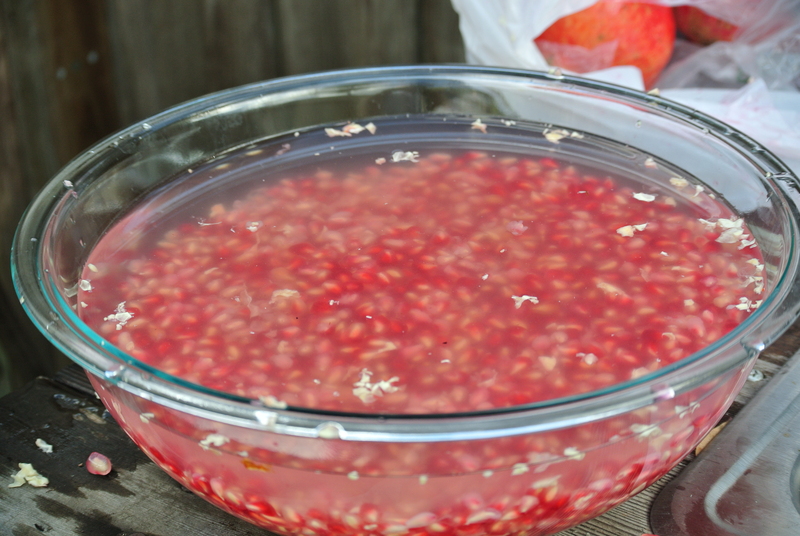 Several years ago I did make a batch from scratch – a lot of work to extract the seeds and squeeze and make jelly…..Today I took a shortcut. I bought some organic, unsweetened pomegranate juice. My batch from scratch was very much like my Aunt’s, both in color and flavor. My store bought juice resulted in a much darker jelly. My Aunt’s jelly was translucent, like rose pink tinted lens. My offering is dark crimson and only allows a hint of light to pass through the jars. 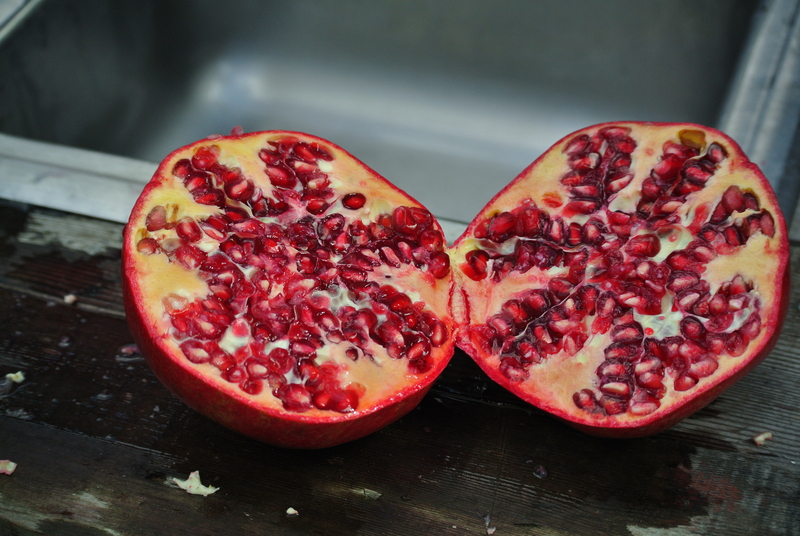 I terms of flavor….I would say my offering is a more robust and has a hearty pomegranate flavor – still, very pleasant. I made two batches, both resulted in approximately 6 – 8 oz. jars. 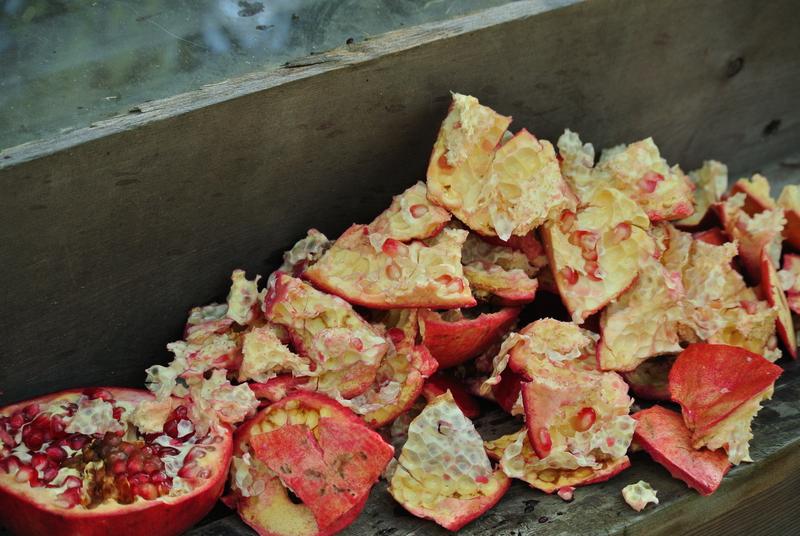 Batch one was straight up pomegranate. 1 smidge of butter to reduce foaming. I followed the Kraft website’s directions for pomegranate jelly. Jelled up very nicely. Batch two. – I added two cinnamon sticks and steeped them in the pomegranate juice for about 15 minutes on very low heat. I left the sticks in as I added the Sure Jell pectin and brought the mix up to a full rolling boil. I removed the sticks and added the sugar and followed to recipe as written. Both batches were processed in a boiling water bath for 10 minutes. The single jar is a small 110 ml jar. In bright sunlight there is just a hint of light passing through. Dark and yummy. The two batches shown side by side; on the right the Pomegranate Jelly and the left Pomegranate with Cinnamon. Yesterday I drove out to Blakelock’s Berries out in Grangerland, 23 miles out from the house, to add a honey super to the hive out at the farm. Added the medium super yesterday on top of the two deep brood boxes. The girls are bringing in lots of pollen and upon close inspection those without pollen appear to have a bit of a swell to the abdomen. Hmmmmm, could it be Blueberry nectar or some other source? Note: Bumble bee hovering around the entrance before the girls chased it away.